The original fluid flow simulation tool developed exclusively for SolidWorks users, COSMOSFloWorks gives you insight into parts and assemblies related to fluid flow, heat transfer, and forces on immersed or surrounding solids. 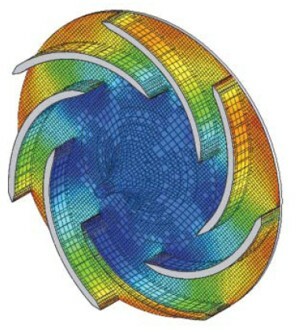 The only fluid flow simulation product fully integrated with SolidWorks. COSMOSFloWorks is incredibly easy to use; you simply tell the software what you’re interested in instead of having to translate analysis design goals into numerical criteria and iteration numbers. Compare different designs based on flow analysis using SolidWorks configurations and choose the optimal design for final production. A wizard-based approach to setup flow problems. Automatic generation of fluid volume based on your SolidWorks assembly. No need to create fluid volume as a separate component. All flow parameters are associative with your SolidWorks geometry and automatically update with changes in your design. Physical Models for engineering applications. toothpaste, and blood, which makes it ideal for engineers in nearly every industry. Internal flow: Flow of liquids and gases through valves, regulators and ducts. External flow: Flow of liquids and gases around solid bodies like flow of air over an airplane or flow of water around a submarine. Transient flow: Simulate unsteady flow over a short period of time. Turbulent flow: K-E model to understand turbulence in the flow domain, for example, the flow of gases from an aircraft engine nozzle. Compressible flow: Analyze gas flows in subsonic, transonic, and supersonic speed zones like flow around an aircraft engine moving at the speed of Mach 1. Heat transfer: conduction, convection (natural and forced convection). Wall roughness: Calculate pressure drop on pipes based on its surface roughness value. 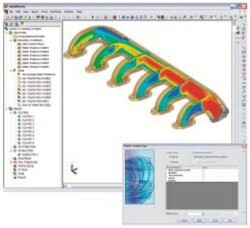 CFD-based design optimization: Optimize your design based on model dimensions and flow parameters. Porous media: Simulate components like industrial filters or catalytic converters to understand how they affect your designs. Rotating reference frame: Understand complex rotational flow inside turbo machinery (like pumps, impellers, etc). Non Newtonian liquids: Solve flow problems involving liquids like blood, toothpaste, and plastic melt. Moving wall: Study flows relative to a moving reference frame. Radiation: Study heat transfer exchange between high temperature surfaces and also radiation from the sun (solar radiation). COSMOSFloWorks includes several types of boundary conditions to represent real-life situations. Apply inlet velocities, pressures, mass or volume flow rates, and fans. Apply mass or volume fraction if multiple gas types are involved. Simulate the effect of heat generation by applying surface or volume heat source. Simulate the effect of cooling by applying natural or forced convection. Simulate rotating parts by applying one or more rotating frames of reference. Study the effect of heat sinks on electronic components with heat sink emulation. Simulate the effect of solar radiation. Track the behavior of particles suspended in a flow. Apply time and coordinate dependent boundary conditions and heat sources. COSMOSFloWorks utilizes a number of automation tools to simplify the analysis process and help you to work more efficiently. Detect fluid volume automatically from SolidWorks geometry, thereby distinguishing between solid and fluid regions. Mesh both fluid and solid regions automatically. Improve accuracy with solution adaptive mesh generation. Automatically create goal plots to evaluate pressure drop and temperature distribution once the analysis is complete. Save time with a built-in engineering database of commonly used liquids, gases, solid materials, fans and units, or customize it with your own materials. Interpret results with powerful and intuitive visualization tools. Once you have completed your analysis, COSMOSFloWorks offers a variety of results visualization tools that allow you to gain valuable insight into the performance of your models. Study the distribution of result quantities with section plots (including velocity, pressure, vorticity, temperature, mass fraction, etc). The section plots can be moved dynamically. Measure results at any location with Probe tool. Graph result variation along any SolidWorks sketch. List results and automatically export data to Microsoft Excel. 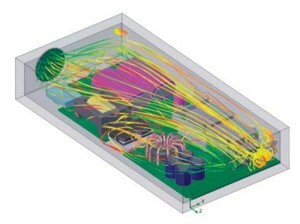 Examine the flow trajectory inside or around the model with animated bands, 3D arrows, or spheres. Collaborate and share analysis results. Generate customized engineering reports in Microsoft Word format. Save result plots in several standard formats, such as BMP and JPEG. Export animations of results as an AVI. Publish eDrawings™ files with analysis information.